HomeDBBIA EventParty in the LANE hits Downtown Brampton on September 29! 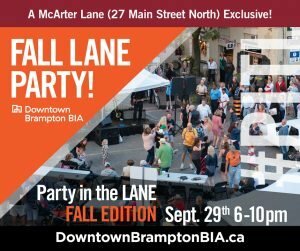 Party in the LANE hits Downtown Brampton on September 29! Brampton, Sept. 26, 2017 – The Downtown Brampton BIA (Business Improvement Area) is pleased to present Party in the LANE on Friday, September 29. Party in the LANE is back by popular demand after a successful laneway event during Classic Cars Celebration this past July. The well-known event will take place on Culture Days weekend lining up with several other events happening in the downtown core. The David Love Band 6:00-7:30 p.m.
Salsa/Bachata/Kizomba lessons by 123Salsa 7:30-8:15 p.m.
Stacey Renee Band 8:15-10:00 p.m. The David Love Band will open up the evening hitting the main stage from 6:00-7:30PM leading the evening into some Latin fusion. 1-2-3 Salsa will be spicing up the evening with free Salsa, Bachata and Kizomba lessons from 7:30-8:15 p.m. Stacey Renee Music will take the stage from 8:15-10:00 p.m. ending off the evening. McArter Lane will be host to 15-20 local vendor pop-ups (both food and retail) providing guests with the opportunity to shop local and enjoy some delicious food! PhotoboothTO will be on-site with their party booth/props allowing guests to go home with a cute photo strip memory of the evening! Party in the LANE has something for everyone to enjoy, so bring your dancing shoes, appetites, and shopping excitement to Downtown Brampton on September 29!